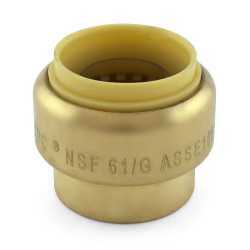 These fittings allow to terminate one end of a copper, PEX or CPVC pipe. Push to Connect plugs are an easy way to create watertight seals – simply push the pipe in and the connection is made. The PF-P3-LF from OmniGrip is a 1/2” Push to Connect CTS Plug, Lead Free. Push to connect plug is th.. The PF-P2-LF from OmniGrip is a 3/8” Push to Connect CTS Plug, Lead Free. Push to connect plug is th.. The PF-P4-LF from OmniGrip is a 3/4” Push to Connect CTS Plug, Lead Free. Push to connect plug is th.. The PF-P5-LF from OmniGrip is a 1” Push to Connect CTS Plug, Lead Free. Push to connect plug is the ..